Bill Wolfe, one of the petitioners, urged the governing body Wednesday night to formalize support for the petition or hold a public hearing. 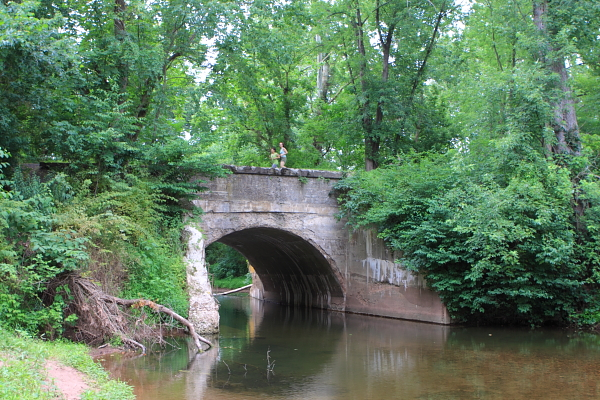 The West Amwell Township Committee met tonight – item # 9.g. on the agenda, listed as “unfinished business”, was complaints by residents: “Fulper/Johanna Farms Sludge Odors/Petition”. Although I had a conflict with the quarterly meeting of the Delaware River Wild & Scenic Management Committee where Bull’s Island was on the agenda, I felt obligated to go to West Amwell, especially because my letter, and DEP complaints, and DEP petition put the issue on the agenda (and I missed the prior meeting due to another conflict). Let me keep it simple and just say that the Committee members were not sympathetic to those making the complaints, were clueless and non-responsive about odor and water quality issues, and showed no interest whatsoever in doing anything. I began by noting that the DEP’s September 20, 2012 letter to Johanna Farms was not included in the correspondence in the minutes (even though mayor Fisher was copied on it via email). I mentioned the bad press coverage for the Township and challenged the Committee to take a stand in support of residents opposed to the severe odors. Right out of the box, before I could really get into the issues, Mayor Fisher said he didn’t think the smell was that bad, that residents were divided over the issue, and that it was a DEP issue that the Township had no authority, responsibility or role in. Nothing to see here – Move on. Worse, Deputy Mayor Zach Rich then immediately attacked me and spoke about his “fear” of the Pennsylvania DEP. Rich told a story about his business as a quarry/mine/stone crushing plant operator and a small diesel spill. He said he shut the plant down in “fear” of DEP and said environmental agencies have done “nothing for anybody”. I reminded Deputy Mayor Rich that his extremist and negative views on environmental regulations and DEP as a business man were his own affair, but that he was totally out of line making those kind of statements as a public official and representative of Township residents, including me, his constituent. I then highlighted DEP’s highly unusual quick action and compared that with the long history of inaction by the Township. Did they want residents to think that DEP in Trenton was more responsive to local concerns than they were? I think I embarrassed them into asking DEP for a public hearing on the petition to revoke the Johanna Farms General Permit. Both Mayor Fisher and Rich agreed with my suggestion for a public hearing and supported a request to DEP for a public hearing on the petition. But, they didn’t say how they would do that – I recommended a Resolution or a letter, but those recommendations were ignored. Fellow resident and petitioner Cathy Urbanski spoke and traced some of the history, particularly in explaining why this was not a Right to Farm issue. The Township Attorney Mr. Faherty agreed about the stench and said the Right to Farm law does not trump the US Constitution’s right to “life, liberty and the pursuit of happiness”, saying that there was no happiness in his home when the Johanna sludge stench was in the air. When I explained the need for DEP odor verification before the Johanna permit could be enforced, the Attorney agreed and replied that the DEP on scene verification of odors in West Amwell was “never gonna happen” and he even volunteered to let a DEP enforcement staffer stay in his home overnight, “for free”. 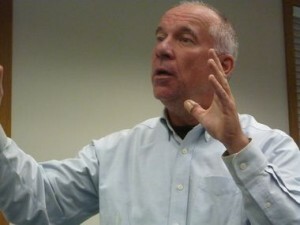 The Attorney also agreed with me that the Right to Farm law did not trump NJ State Environmental laws. If residents want something done, they need to pressure DEP – their local elected officials are hopelessly in the tank for Mr. Fulper on this one. 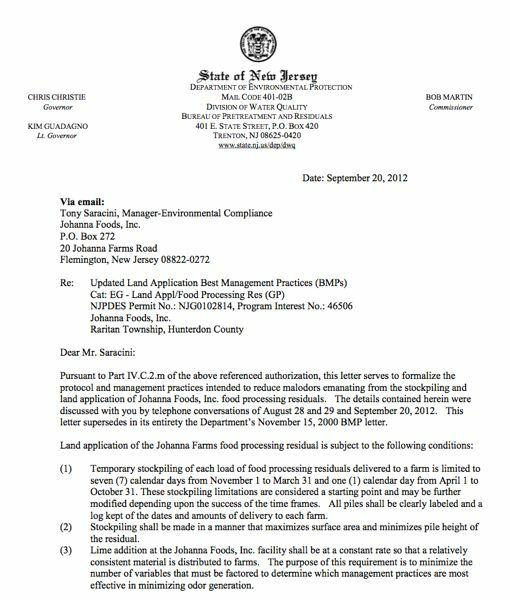 [Update: I just requested that DEP hold a public hearing on the petition to revoke the Johanna Farms permit. This is what the Township Committee should have done last night. I would like to supplement my recent petition seeking revocation of the Johanna Farms General Permit with the following request. We ask that the Department hold a public hearing on the petition in West Amwell as part of the decison-making process. Although a public hearing is not mandated by applicable rules, such a hearing would provide an opportunity for the community to weigh in and allow the Department to gather important new information prior to making a final decision in this important matter. We look forward to your earliest and favorable consideration of this request. The Governor might just as well have conducted a Voodoo session or a rain dance to stimulate the economy or jobs. The Permit Extension Act has no justification in supporting evidence and has nothing to do with economic development, DEP, or environmental regulation. 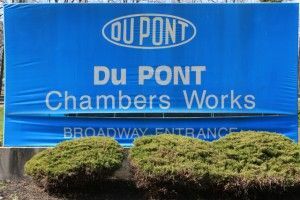 We repeatedly have written that the Permit Extension Act is the worst kind of fraud (see: “Both Sides get it Wrong on Permit Extension Act“) and recently again tried to explain that extending a glut of previously approved DEP permits will do absolutely nothing to stimulate demand or in any way promote economic development. Trenton — To hear Governor Chris Christie tell it, long delays and uncertainty in issuing environmental permits are a major factor limiting economic growth in New Jersey. In fact, the overwhelming majority of DEP permits are approved and issued on time, but the public would not know it because the state Department of Environmental Protection (DEP) stopped issuing its annual report on permitting back in 2007, according to Public Employees for Environmental Responsibility (PEER). Under a law enacted in the early 1990’s known as “EMAP” (Environmental Management and Accountability Plan), DEP is required to submit an annual report to the legislature on permit review timeframes and approval rates. The most recent report showed that DEP approved more than 95% of permit applications, and the large majority was approved within established review timeframes. These numbers contradicted two central premises of the Christie administration: 1) DEP permit review delays impede economic growth. Governor Christie claims that companies relocate to other states to avoid permit delays in New Jersey; and 2) A low DEP permit approval rate allegedly creates uncertainty which deters investment. Perhaps not surprisingly, the actual numbers never reappeared. When he came into office, Gov. Christie launched a “Red Tape Commission” that targeted DEP permitting and regulations as the key to generating jobs. “Permit Extension” legislation to eliminate the need to renew lapsed permits. This bill passed both houses of the Legislature and is on Gov. Christie’s desk awaiting final approval. This parade of relaxations ignored the recommendations of a “Permit Efficiency Taskforce” convened by former DEP Commissioner Lisa Jackson. Composed largely of industry “stakeholders,” this Taskforce produced a series of technical improvements that the Christie administration never revisited. The Governor is hopelessly mired in right wing slogans – he has lost grip with reality. Economic growth will only occur if demand is stimulated – that means a bottom up traditional Keynesian policy – but that is anathema to his 1% Corporate cronies. In the ultimate Friday night massacre, just after Governor Christie issued an edict to threaten whistleblowers who release embarrassing financial data, the Governor vetoed a bill [A575/S253] that would have banned the processing and disposal of fracking wastewater and drilling wastes in NJ. Governor Christie today vetoed legislation that would have banned the treatment or disposal of waste from fracking, arguing that the ban would have been an illegal obstruction of interstate trade. 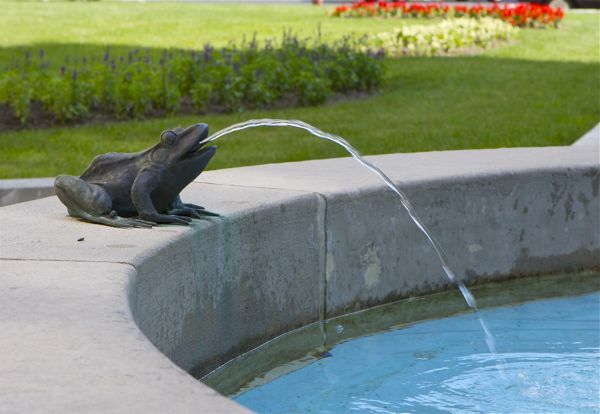 “The governor’s decision is a slap in the face of every New Jerseyan who cherishes clean water,” said state Sen. Robert Gordon, D-Fair Lawn, one of the ban’s sponsors. Another sponsor, Assemblywoman Connie Wagner, D-Paramus, agreed. ‘For someone who talks so much about leadership,” she said of Christie, “it seems contradictory to punt on this issue when it could potentially put our residents in harm’s way while we wait for the federal government to take action. Gordon and Wagner also cited an opinion issued by the non-partisan Office of Legislative Services, which concluded the ban would not violate the Dormant Commerce Clause because the ban would have included fracking waste from New Jersey, so as not to discriminate among states. Legislators took testimony and the bill was carefully crafted to avoid an impermissible burden on inter-state commerce. The bill was not only non-discriminatory with respect to commerce, it was grounded in and based on the legitimate State police power to protect public health and the water resources of the state from pollution. I testified on some of those issues, which arose out of NJ’s experience in blocking garbage imports. The Governor’s political spin and excuse for the veto flat out contradicts independent Office of Legislative Services lawyers who confirmed that the bill would not restrict inter-state commerce. Shockingly, the NJ Business and Industry Association wants to turn the clock back 50 years, and return NJ to the waste importation capital of the Eastern seaboard – and more absurdly, do so on the basis of Republican political talking points: “job creation” (conveniently just presented to the Republican Governors Assc.). Talk about a race to the bottom! NJ is Open For Business – we are competing to import toxic waste from Pennsylvania, New York, Ohio, West Virginia…! So there it is – NJ is coming full circle. 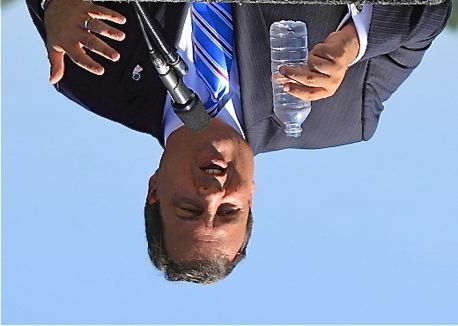 But instead of taking Philadelphia and New York’s garbage, Governor Christie’s “New Jersey Comeback” will have us importing fracking wastewater to the Dupont facility in Deepwater – the treated fracking wastewater will then be discharged to the Delaware River. But, as experts have warned, current wastewater treatment technology can not remove many of the pollutants in fracking wastewater, including radioactive compounds. That should blend in to the background just nice, as that wastewater dilutes and flows down the Delaware river, past the Salem Nuclear Complex. Indeed, throughout the emotional and heated legislative hearings on this bill, the Fracking Waste produced in neighboring states was repeatedly referenced, demonstrating the impermissible, discriminatory intent and effect of Assembly Bill No. 575 to exclude out-of-state Fracking Waste in violation of the Dormant Commerce Clause. 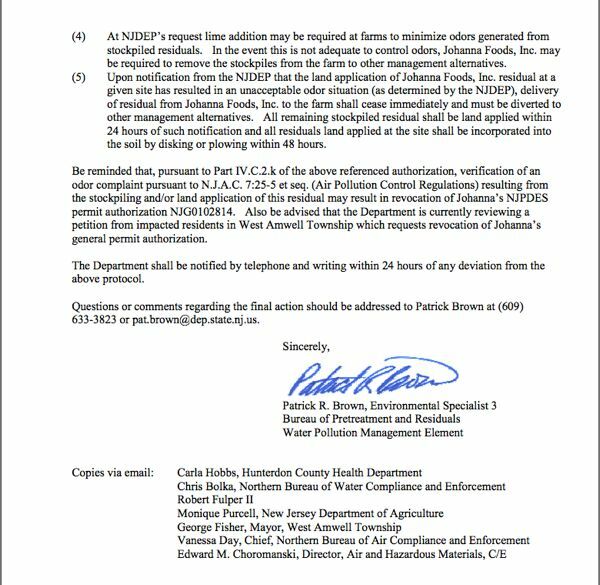 I just received a letter (full text below) from DEP to Johanna Farms – DEP has added additional restrictions and controls on the land application of the wastewater sludge residual on area farms, including the controversial Fulper operations in West Amwell. This move by DEP was prompted by my complaints and those of other residents, but is not a formal response to our recent petition to revoke the Johanna permit. Obviously, revocation of the Johanna permit would be a better solution than tightening the conditions of the existing permit.